Congratulations to our Client Quoquos for their feature on Flavorful Excursions! Health-conscious families and dedicated athletes everywhere are reading about the energy boost and healthy benefits of coconut oil as a supplement. But did you know that you have to eat 3 – 5 tablespoons a day to make a difference? That much coconut oil can be hard to swallow and digest, unless your coconut oil is Quoquos! 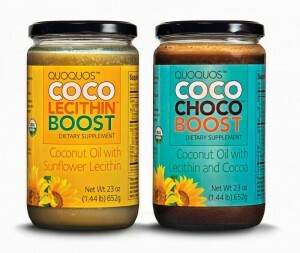 Sunflower lecithin makes Quoquos different. They’ve added just enough of the sunny ingredient into their 100% organic coconut oil to make it easy to digest, even when eaten every day. It helps Quoquos Â blend completely into smoothies and other liquids for a creamy and pleasant consistency. And sunflower lecithin has natural non-stick properties, so it’s excellent for cooking too, just like traditional coconut oils, only better. Gotta love that. Check them out atÂ quoquos.com!